Choosing a new garden hose sounds simple. Once you start digging into the options, though, a vast variety awaits. It all depends on the amount of use the hose will get, how long it needs to be, the water temperature or pressure required, the durability and materials desired, and more. This article examines the options to help you find the best garden hose. 1. Why Buy a New Garden Hose? Even if your old hose isn't full of leaks or prone to blocking your water with kinks, there are several reasons to consider a new hose. There are many lightweight hoses available, ideal if you have trouble lifting heavy objects or carrying them long distances. Many are designed with superior durability, for commercial or landscaping use. Stainless steel hoses decrease the risk of punctures. Or, you may just need a longer hose or one that handles higher water pressure. All of these issues can be resolved with the purchase of the best garden hose for your needs. 2. Where Can You Buy One? All the hoses in this article are available for purchase on Amazon. Many are also available from hardware stores or large home supply retailers, such as Home Depot, Target or Walmart. Price depends on many factors, including the materials used in the fittings, the type of reinforcement on the other side of the fittings, the length and diameter of the hose, and the composition of the hose itself. Most shorter hoses in this article have a price of under $40 on Amazon. We considered many garden hoses for this article, but we aimed only for the best. We evaluated each one for durability, usability and construction quality. Customer reviews and best-seller status were also a factor. Frequently mentioned issues, both positive and negative, were given more weight than opinions that only came up once or twice. All these factors were rolled into a rating of one to five stars. For this article, we have included only products that received four or more stars. 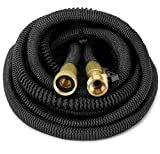 All of the garden hoses reviewed have prices from $27.99 to $65.39. All prices listed are Amazon prices at the time of writing and may be less than the actual list prices. The Monyar garden hose expands from 17 feet to its fully extended 50-foot length when water flows through it under pressure. This makes it easy to store in a compact space when it's not in use and helps prevent kinking. It's also lightweight at just 3 pounds. The strong fiber in the outer layer of the hose protects the inner layers of latex while allowing great flexibility. A convenient brass on/off valve built into the durable brass fitting makes it easy to control the water flow without returning to the faucet. This product also includes a nine-position spray nozzle, drawstring storage bag, hose hook and extra washers. Soft, flexible, slim, lightweight, & effortless to use. Will not permanently kink. Contains no lead, BPA, Phthalates or other toxic chemicals. The Water Right garden hose is made of flexible polyurethane resin with strain reliefs on both ends to prevent kinking. The brass fittings are plated with trivalent chrome to resist crushing and tarnishing while being environmentally responsible. This hose is easy to carry, as it weighs just 3 pounds. It will stand out in your yard because you can get one in cranberry, eggplant, espresso or olive green colors. The more expensive 500 and 600 Series hoses have larger diameters that increase the maximum flow rate and pressure. This Flexzilla hose gives you a better grip when you're attaching it at either end. The swivel grips also keep the hose from kinking or twisting at the ends, so your sprinkler will stay upright. The hose itself has a hybrid polymer composition, which lays flat on the ground but is easy to roll up. It also resists kinking and is relatively lightweight at 8 pounds. The fittings inside the swivel grips are made of anodized aircraft aluminum, which is durable and crush-resistant. The 50-foot version is available in Brown Mulch, Red Clay or the standard ZillaGreen colors. 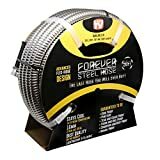 This Forever garden hose is plastic encased in strong 304 stainless steel, making it relatively lightweight and kink-free. The steel prevents damage from thorns, animals, nails and other sources of punctures, tears and cracks that would cause leaks in most other hoses. This 5-pound hose will always be free from rust and corrosion. 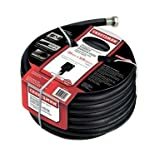 Reinforced radial tire cord rubber is what makes this Craftsman hose unique. It stays flexible at greater temperature extremes than other hose materials and can handle a burst of up to 500 PSI. It also resists kinking. The fittings on both ends of the hose are brass. It is still a flexible hose, though heavier (10 pounds) than many of the others reviewed here. This Orbit hose takes up little space when not in use, since the coiled material contracts when no tension is applied. It is also kink-resistant and extremely flexible. While the fittings are metal or plastic depending on the hose color purchased, the body of the hose is a type of plastic. This makes it lightweight at just 3 pounds. The product includes a spray nozzle with eight settings that matches the hose in color. Varieties available are blue (the default), gray, green, tan and teal. Blue, green and tan hoses come with metal fittings, while the gray and teal hoses have black plastic fittings. The hose is also available in a 25-foot length called the Orbit 27890. This Beaulife garden hose has an outer shell of durable 304 stainless steel covering a plastic inner pipe. It's relatively lightweight at 6 pounds and is flexible and kink-free. The steel should never rust or corrode, and it will prevent tears and punctures that could be made by nails, thorns, animal teeth or other sources. This product includes a rubber-coated metal spray nozzle with eight settings. Commercial-grade construction and durability are what sets this Gilmour Pro hose apart from the rest. It has a 6-ply double-reinforced rubber and vinyl construction. This makes it sturdy and able to resist abrasion and kinks. The fittings are brass, and the faucet end is reinforced with a steel coil. The hose weighs 11 pounds but makes up for the extra weight with strength and heavy-duty construction. It's designed for long life and tough conditions, such as a construction site or manufacturing floor. This hose is also available in a 25-foot length and 100-foot. Gilmour also makes several other heavy-duty hoses, including the Gilmour Pro Farm and Ranch hose and the Gilmour Flexogen line. 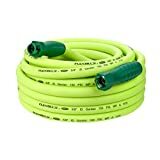 The GrowGreen hose expands from 17 feet to 50 feet long under pressure, like the Monyar garden hose described earlier. This kink-resistant product requires little storage space and is easy to carry at 2.5 pounds. A durable outer fiber protects the inner layers of its latex pipe. An on/off valve with a plastic handle is built into the brass fitting on the nozzle end of the hose. This makes it easy to turn the flow on and off while you're watering, rather than walking back to the faucet each time. It also comes with a spray nozzle that has eight different settings. The GrowGreen hose is available in several lengths in addition to the 50-foot model: 25 feet, 75 feet and 100 feet. 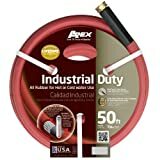 This Apex premium all-rubber hose is designed for high-temperature use up to 180 degrees Fahrenheit. It also works well with cold water. A hard rubber sleeve reinforces the hose below the metal faucet fitting for durability and resisting kinks. At 10 pounds, it's not a lightweight hose, but it's also not the heaviest reviewed here. It is also available in a 25-foot length called the Apex 8695-25. Many of the garden hoses reviewed in this article have very different features. With that in mind, it's not really possible to say that one stands out above the rest as the best garden hose. It really depends on what your needs are. If you need a lightweight hose that takes up little space, and also has some durability, you might decide on either the Monyar or GrowGreen expandable hose over the light-duty Orbit coil hose. For a high-quality general-purpose garden hose that doesn't contract in size, the Water Right 400, Flexzilla or Craftsman may be just what you need. If you're specifically shopping for the benefits of stainless steel, consider the Forever or Beaulife hoses. Rounding out the list, the Gilmour Pro and Teknor Apex 8695 are good candidates for commercial use. All these hoses fall into a very similar price range, depending on the length you want, so it should be easy to find one that fits your needs. 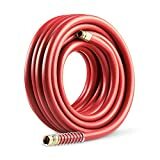 Hey Buddy!, I found this information for you: "Best Garden Hose: Top 10 Best Garden Hoses And Why You Need One". 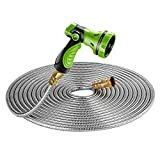 Here is the website link: https://backtofarm.com/best-garden-hose/. Thank you.